TWA Boeing 747 N93119 arrived as Flight TW881 from Athens at New York-JFK at 16:31. The airplane was refueled at JFK and remained at gate 27 with the auxiliary power unit (APU) and two of its three air conditioning packs operating for about 2 1/2 hours until it departed as TWA flight 800. The flight was scheduled to depart JFK for Paris about 19:00; however, the flight was delayed because of a disabled piece of ground equipment and concerns about a suspected passenger/baggage mismatch. The aircraft was pushed back from the gate about 20:02. Between 20:05 and 20:07, the flight crew started the Nos. 1, 2, and 4 engines and completed the after-start checklist. The flight crew then received taxi instructions and began to taxi to runway 22R. While the airplane was taxiing, about 20:14, the flight crew started the No. 3 engine and conducted the delayed engine-start and taxi checklists. At 20:18:21, ATC advised the pilots that the wind was out of 240-degrees at 8 knots and cleared flight 800 for takeoff. After takeoff the pilots received a series of altitude assignments and heading changes from New York Terminal Radar Approach Control and Boston ARTCC controllers. At 20:25:41, Boston ARTCC advised the pilots to climb and maintain FL190 and expedite through FL150. At 20:26:24, Boston ARTCC amended TWA flight 800's altitude clearance, advising the pilots to maintain FL130. At 20:29:15, the captain stated, "Look at that crazy fuel flow indicator there on number four .. see that?" One minute later Boston ARTCC advised them to climb and maintain FL150. The crew then selected climb thrust. After a every loud sound for a fraction of a second, the CVR stopped recording at 20:31:12. At that moment, the crew of an Eastwind Airlines Boeing 737 flying nearby reported seeing an explosion. The aircraft broke up and debris fell into the sea, 8 miles south off East Moriches. PROBABLE CAUSE: "An explosion of the center wing fuel tank (CWT), resulting from ignition of the flammable fuel/air mixture in the tank. The source of ignition energy for the explosion could not be determined with certainty, but, of the sources evaluated by the investigation, the most likely was a short circuit outside of the CWT that allowed excessive voltage to enter it through electrical wiring associated with the fuel quantity indication system. 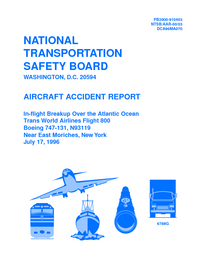 Contributing factors to the accident were the design and certification concept that fuel tank explosions could be prevented solely by precluding all ignition sources and the design and certification of the Boeing 747 with heat sources located beneath the CWT with no means to reduce the heat transferred into the CWT or to render the fuel vapor in the tank nonflammable." This amendment supersedes an existing airworthiness directive (AD 96-26-06), applicable to certain Boeing Model 747 series airplanes, that currently requires a one-time inspection to detect damage of the sleeving and wire bundles of the boost pumps of the numbers 1 and 4 main fuel tanks, and of the auxiliary tank jettison pumps (if installed); replacement of any damaged sleeving with new sleeving; and repair or replacement of any damaged wires with new wires. For airplanes on which any burned wires are found, that AD also requires an inspection to detect damage of the conduit, and replacement of any damaged conduit with a serviceable conduit. This amendment requires repetitive inspections in lieu of the one-time inspection. This amendment also expands the applicability of the existing AD. This amendment is prompted by reports of chafing of the sleeving. The actions specified in this AD are intended to detect and correct abrasion of the Teflon sleeving and wires in the bundles of the fuel boost pumps for the numbers 1 and 4 main fuel tanks and of the auxiliary tank jettison pumps (if installed), which could result in electrical arcing between the wires and the aluminum conduit and consequent fire or explosion of the fuel tank. This rule requires design approval holders of certain turbine- powered transport category airplanes, and of any subsequent modifications to these airplanes, to substantiate that the design of the fuel tank system precludes the existence of ignition sources within the airplane fuel tanks. It also requires developing and implementing maintenance and inspection instructions to assure the safety of the fuel tank system. For new type designs, this rule also requires demonstrating that ignition sources cannot be present in fuel tanks when failure conditions are considered, identifying any safety-critical maintenance actions, and incorporating a means either to minimize development of flammable vapors in fuel tanks or to prevent catastrophic damage if ignition does occur. These actions are based on accident investigations and adverse service experience, which have shown that unforeseen failure modes and lack of specific maintenance procedures on certain airplane fuel tank systems may result in degradation of design safety features intended to preclude ignition of vapors within the fuel tank. This final rule adds a provision to the existing requirements for fuel tank system fault tolerance evaluations that allows type certificate holders to use equivalent safety provisions for demonstrating compliance. The current regulations do not provide such provisions. This rulemaking will allow current certificate holders to use the same equivalent safety provisions already available to applicants for new or changed type design approvals. This final rule extends the compliance deadline for supplemental type certificate holders to complete safety assessments of their fuel tank systems, and any system that may affect the fuel tank system, and to develop design changes and maintenance programs needed to correct unsafe conditions. It also extends the compliance time for the affected operators to incorporate instructions for maintenance and inspection of the fuel tank system into their maintenance or inspection programs. This action is needed to allow supplemental type certificate holders additional time to complete their compliance submittals using a newly identified method of completing their safety assessments and identifying corrective actions without acquiring information from the type certificate holders. Because the operators are dependent upon the supplemental certificate holders for showing compliance with the operating rules, this rule allows them the same time extension. Distance from New York-John F. Kennedy International Airport, NY to Paris-Charles de Gaulle Airport as the crow flies is 5794 km (3621 miles).